I would like an update on a product called the “Wii Vitality Sensor” which was announced a few years ago. A considerably long time has passed since it was first announced, so I assume that the development might have come to a standstill, and I am concerned that this type of thing will happen again in the future. In addition, I heard that the quality of the company cafeteria is not so good from one of my acquaintances who works for Nintendo. I think you should ensure that everybody is able to enjoy eating at the cafeteria as a part of the employee welfare program and improve internal communication among employees. The Wii Vitality Sensor was under development as an accessory for Wii. We thought it would be interesting to understand how the human autonomic nerve functions while using the Wii Vitality Sensor, and we did develop trial software and showed the media some of its features. We pushed forward its development on the academic assumption that by observing the wave patterns of the human pulse, we could quantify how tense or relaxed a person is, or to be more specific, how much the sympathetic and parasympathetic nerves work as functions of the autonomic nerve. However, after a large-scale test of a prototype inside the company, we found out that for some people the sensor did not work as expected. We wondered if we should commercialize a product which works as expected for 90 people out of 100, but not so for the other 10 people. Though I am sorry that we did not give any specific updates after this product’s initial announcement, I would say that knowing that a product has a problem we should not launch it for the sole reason that we have already announced it. The Wii Vitality Sensor is an interesting device, and we did various experiments to see what is possible when it was combined with a video game. But, as a result, we have not been able to launch it as a commercial product because we could not get it to work as we expected and it was of narrower application than we had originally thought. We would like to launch it into the market if technology advancements enable 999 of 1,000 people to use it without any problems, not only 90 out of 100 people. I actually think that it must be 1,000 of 1,000 people, but (since we use the living body signal with individual differences) it is a little bit of a stretch to make it applicable to every single person. In any case, its launch has been pending because we decided that the Wii Vitality Sensor’s current result is insufficient as a commercial product. You might be anxious that there will be other launch cancellations of products we have already announced. Indeed, it is difficult to decide the time to announce a product. If we announce a new product just before the launch date, we may hear some fans say that they cannot purchase it because the announcement was so sudden. However, if we provide too much information well before the launch date, people will become so used to hearing about it that they may even feel as if they have already played it and experience déjà vu when we finally do launch it. In this way, I believe that the timing of new product announcements is a difficult issue. For example, we discuss, “For this product, we should announce its launch at such time,” or “It is a good time to explain a little far-off future of Wii U” depending on the type of product and the profile of its target consumers. Though we should obviously do our best to fulfill the promises we make, we consider that we should announce a new product when we come to a stage where there will be minimal change to the contents of the announcement in the future. The reason for this is that it would ruin the trust of our consumers if we ignore the quality finish or launch an incomplete product only to adhere to the announced launch date. I hope you can understand that there is a possibility that we will postpone the launch of a new product or put it in a pending state if we determine that it does not meet the quality standards that we require. As for our company cafeteria, we regularly hear the same opinion when we gather feedback from employees. However, opinions vary considerably by individual and not all the employees agree with this. Still I examine such an opinion as an issue of the company because we receive such feedback constantly. Thank you. Both the sales of the last fiscal year and the year before have dropped to a level of 600 billion yen, but around the year 2000, sufficient profit was made even at a similar level of sales. You have suffered operating losses in the recent two fiscal years, but I believe you could have made the same level of profit as before if your cost structures had been equal. If high costs were the reason, shouldn’t you have carried out corporate restructuring? Your question was why Nintendo suffered operating losses in its 72nd and 73rd fiscal terms, despite the fact that Nintendo was able to earn enough profits in the past with the same level of sales. Regarding this question, there is one aspect that is very easy to understand. 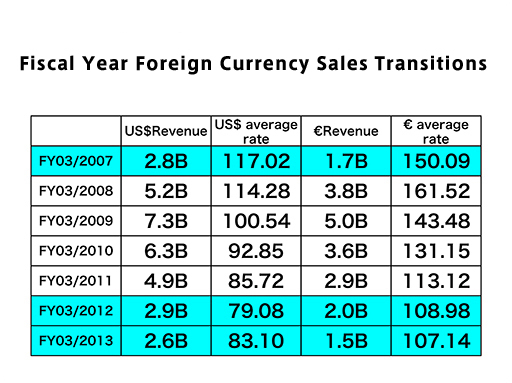 This table shows changes in sales in foreign currencies. Please look at the top colored row (the fiscal year ended March 31, 2007) and the bottom two rows showing the latest two periods with operating losses (the fiscal years ended March 31, 2012 and 2013). 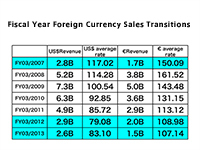 The second column from the left shows U.S. dollar-denominated sales and “2.8B” means 2.8 billion dollars. The figures in the bottom two rows (for the most recent two fiscal years) are 2.9 and 2.6 billion dollars respectively. Then I would like you to compare the exchange rate of the top row with that of the lowest ones. Yen-denominated sales are calculated by multiplying these sales figures such as 2.8 and 2.9 billion dollars by these exchange rates. Therefore, you will understand even if the scale of our businesse in the United States is the same, the yen-denominated sales shrink because of the appreciation of the yen against the dollar. Nintendo mainly carries out development in Japan, so almost all development costs are incurred here. Nintendo purchases component parts in dollars as much as possible in order to enjoy the benefits of a weak dollar. However, appreciation of the yen against the dollar generally negatively affects Nintendo’s financial results. Euro-denominated sales figures on the right are 1.7 billion euros for the fiscal year ended March 31, 2007, 2.0 billion euros for the fiscal year ended March 31, 2012 and 1.5 billion euros for the fiscal year ended March 31, 2013. With respect to the rightmost exchange rates of the euro, the business environment in recent years was totally different from that in the fiscal year ended March 31, 2007 when the exchange rate was 150 yen per euro. I would like you to understand that the influence of exchange rates is the main aspect of this matter. Regarding U.S. dollars, as I mentioned earlier on, the influence can be offset to some degree with dollar-based purchases. Concerning the euro, on the other hand, even though we have attempted to increase the number of partners who receive payments in euros, the number is still very low. One more difference from that time is Nintendo’s head-count. The manpower required for increasingly complex and advanced product development has totally changed from that of the past. Hence, the number of employees has increased and higher costs have been incurred. In addition, due to development of more elaborate software titles than before, for example, costs associated with localizing titles in English or other languages have risen. Regarding why we have not reduced the number of the personnel, it is true that our business has its ups and downs every few years, and of course, our ideal situation is to make a profit even in the low periods, return these profits to investors and maintain a high share price. I believe we should continue working toward this ideal. If we reduce the number of employees for better short-term financial results, however, employee morale will decrease, and I sincerely doubt employees who fear that they may be laid off will be able to develop software titles that could impress people around the world. I believe we can become profitable with the current business structure in consideration of exchange rate trends and popularization of our platforms in the future. We should of course cut unnecessary costs and pursue efficient business operations. I also know that some employers publicize their restructuring plan to improve their financial performance by letting a number of their employees go, but at Nintendo, employees make valuable contributions in their respective fields, so I believe that laying off a group of employees will not help to strengthen Nintendo’s business in the long run. Our current policy is to achieve favorable results by continuously cutting unnecessary expenses and increasing business efficiency. Thank you for listening. 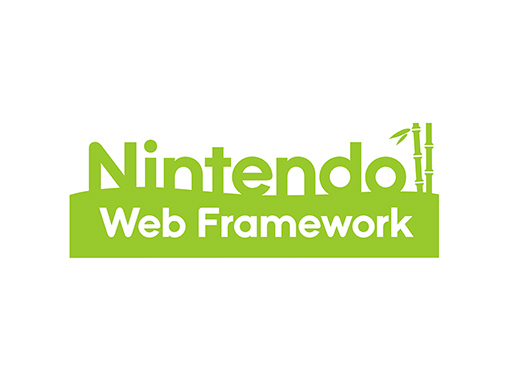 Please let me know your thoughts on what you would like to achieve with “Nintendo Web Framework.” Will you widely open development opportunities to individual developers? I have just described “Nintendo Web Framework,” but I guess my explanation might have been a little too simple. We have publicly set forth the goal of “gaming population expansion” or “user population expansion,” but when it comes to the Nintendo Web Framework project, we are calling it internally at Nintendo “developer population expansion.” Development of games for dedicated game systems has gradually become possible only for large-scale development teams. The best situation for a game platform is one where even a game developed over a short period by a small team could become very popular around the world. Many developers dream about competing to make a game for such a platform. However, recent video game machines are, in a sense, becoming rather unique systems because they require the software creators to use development methods specific to each game system, employ a large development staff and spend a considerable amount of time in order to develop a packaged software title for which consumers are willing to spend several thousand yen. 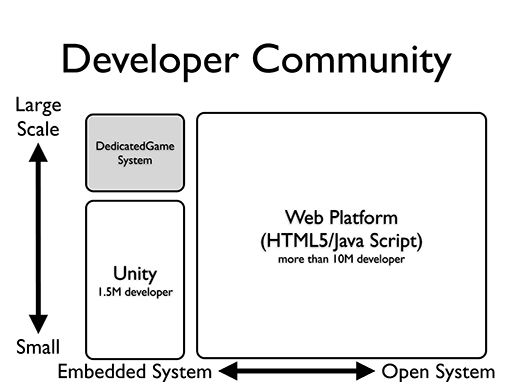 This is a conceptual diagram of developer communities. The vertical axis shows the scale of a community. On the horizontal axis, “Embedded System” on the left is a system required for a dedicated development approach and “Open System” on the right is a system widely used in the world. When you access an active website, a special program to control actions has been automatically downloaded from a server and executed. This is an example of the technologies called “Web Platform.” This diagram also has information on the population of developers for each system. Currently, the top-left “Dedicated Game System” has a relatively small number of large-scale development teams left. As dedicated game systems require a unique software development method, developers have to learn a lot to understand such a method and then make considerable efforts to create game programs for such systems. The entry levels are going up because developers need to know a lot of things before starting developing games for Nintendo 3DS or Wii U for the first time. 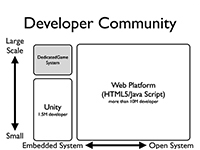 The bottom-left “Unity” is a video game engine with a vast number of developers around the world, which can easily be used to develop games for various platforms. We have started working to expand the developing population by organizing a partnership with Unity and making this engine available to Wii U developers. 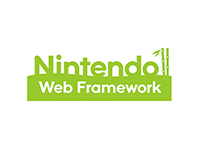 “Nintendo Web Framework” that you asked about is a system we have prepared so that the more than ten million developers of the right-sided “Web Platform” can relatively easily develop games for Wii U. However, since we are currently not capable of dealing with a vast number of individual developers, we cannot go so far as to widely open development opportunities to them tomorrow. However, we are accepting ideas from any corporations which are interested in it regardless of their scale or development experience and are considering the possibility of accepting individual developers in the future. This is the first step to increase the number of developers for dedicated game systems, which we started more than two years ago and announced this March. We hope that this will expand the potential of video games. Thank you for your understanding of our strategy. I would like to know about Nintendo’s network policy. These days, the number of opportunities to enjoy games by connecting with other people has increased because of social games. Thanks to a focus on network expansion for both Nintendo 3DS and Wii U, the number of games with network functionality has increased, but games such as “New Super Mario Bros. U” for Wii U cannot connect to a network. I want to hear whether you decided not to include network functionality in it because of a company policy, or whether it was just because of technical problems. In addition, even when we pay several thousand yen for packaged software, it does not provide sufficient information on network play and the website does not explain the details either so we don’t know about it before purchasing the product. More specifically, I never know exactly what such phrases as “network play available” mean. I cannot tell whether it is possible to play with my family in our living room and with friends online, or whether it means only one person from the local network can connect with others online. What is your opinion on this issue? Please let me give you a broad overview of the network policy for Nintendo games. There are several ways to make games more interesting by using a network structure. The first and most widely known way is to play video games with people in a distant place. For instance, I can play Mario Kart together with Mr. Miyamoto when he is in a different location. Still, even though you do not need to be in the same place, it does not eliminate the fact that you must play the game at the same time. We have laid emphasis on a service called “Miiverse” since the release of Wii U. Basically, users can pause most games, visit Miiverse and share their impressions or precious scenes from the game in addition to learning how others play the game. Miiverse is also helpful to learn about games before making purchases, and it appears that quite a few people appreciate that other players understand and empathize with their impressions. If the structure of Miiverse is developed more, users will also be able to exchange their play data with others, making it possible to play a game with another person without doing it at the same time. I think that the best way to use network play differs depending on the game. For “New Super Mario Bros. U,” which a maximum of five people can play together in front of the TV, we focused most of our effort on enabling those five people to enjoy the game all together so we did not focus on online play. On the other hand, through Miiverse we provide information such as play tactics and strategies, and we have received a lot of positive feedback. We are developing Mario Kart and Super Smash Bros. for Wii U, and in these two games, we would like to meet the expectations of consumers that they want to play together with people in different locations. In addition to that, if we can create an environment in Miiverse where users can play a game with others without sharing the same time and inspire one another through exchanging their game experiences, then I believe that some very interesting things will happen. I would say that our policy at Nintendo is to consider each game’s features and then offer network functionality that takes advantage of these features. We will do our best to achieve this since we believe that there is a consensus that you have more fun when you play with others than when you play alone, and that you feel happy when others understand the impressions and fun you had while playing a game. What you have pointed out about the lack of network play information is very helpful. We will consider this point for future improvements to our product packaging and website. Thank you very much.